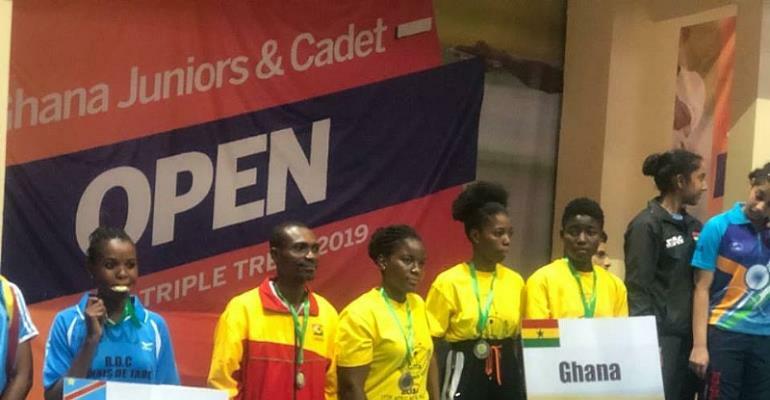 It was a real testing time for local players at the 2019 Ghana Junior and Cadet open but as proceedings came to a close in Accra on Saturday 6th April; all could reflect positively on the experienced gained. Players from foreign shores proved too strong, competitors from England, India, Nigeria and Saudi Arabia, in particular, possessed too much knowledge. Nathaniel Kwesi Somuah, Media Officer of Ghana Table Tennis Association and other sports journalists spoke to Richard Ofori and Emmanuella Yaa Kyere, players had competed in the respective mini-cadet boys singles and mini-cadet girls’ singles events, as well as to Samuel Hagan, a young man who appeared in the junior boys’ events; also they met Matilda Fodu and Augustina Baidoo both on duty in the junior girls category. “I have never played in such a competition; I felt nervous at the start which made me lose most of my matches. However, I have gained some experience and am happy about it,” Richard Ofori noted. “I was excited about playing in the competition. I have gathered a lot of experience which will help me in the future; I hope to learn from that and become a better player,” Emmanuella Yaa Kyere stated. “I have never represented Ghana in a competition. I have learned to be focused; I was under pressure to win which made me commit a lot of errors, causing me to lose matches at the initial stage,” Samuel Hagan emphasised. “The feeling was great, to represent the country on home soil, I never thought it would come so soon. I have lost some matches but I hope to build on the experience and do better next time,” Matilda Fodu stressed. “Personally, I thank the Ghana Table Tennis Association for organising this championship. It has given an opportunity for us to learn. I have learned to be focused throughout a match; I can now determine the weakness of my opponent,” Desmond Osei explained. “Coming into this tournament, I was well prepared. I met strong players from Nigeria, England and India. Playing against them is quite different; their movements behind the table are unique and they play with different styles from what I experience here at home. I am delighted with my performance so far. Coming into this competition I was fully prepared and with the hope of winning a medal. "I have won one medal in the team event and even though I was not able to get any medal in the individual event, I am happy my president brought this tournament here for us to learn new things. We pray that we will play in many more competitions here in Africa and if possible get the opportunity to travel and play outside, because when I played the foreigners I realized I was able to match them but at critical moments I lost points because they are very knowledgeable in the game. "It is our first international tournament and we are not used to the style of the foreigners. I will change my training schedule and train five times a week now since I need to keep myself in shape for future competitions,” Augustina Baidoo intimated. Following the conclusion of the Ghana Junior and Cadet Open, Augustina Baidoo and other local players will now focus on the African Youth, Junior and Cadet Championships. Play commences on Sunday 7th April.